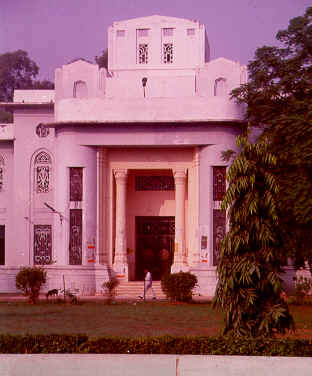 The maintenance of a good library is a sin qua non for any progressive university, therefore, the then Canning College Library was converted into the University Central Library and thus the Tagore Library, the Central Library of the University of Lucknow, came into existence with the establishment of the Lucknow University, late in the year 1920. Initially Tagore Library was located in the old Bennet Hall and rooms between the verandah on the South-Western side of main Canning College building (now Faculty of Arts, main building). In 1924, the Library building was expanded with the inclusion of a separate Reading Room. The plan of the new building for the library was prepared by one Mr. Gorffin, a noted architect and was explained in detail to the members of the Library Committee on December 10, 1935. The model for the two storied building was placed in the old library for the students and staff to make any suggestions for improvement or innovation in the plan. However, there was inordinate delay in approving the plan, which had sailed in rough weather for some time. The main architect Mr. Gorffin died in the meantime. Foundation stone of the new building (present building) was laid by the then Chancellor in March 1937, but the start of construction work took quite some time. After the death of main architect Mr. Gorffin, one Mr. Nowekar was assigned the responsibility for the architectural portion and supervision of the work on payment of a sum of Rs. 2000/-. A sum of Rs. 1,50,000/- had been set apart for its construction by the University. It took a couple of year in completion of the building. The Chancellor - Governor Sir M. Hallet, opened the new library building (the present library building) on April 2nd, 1941. While inaugurating the new building Sir M. Hallet referred to the great importance of a library in a modern University life as well as in national life. Later on the present library building was extended and the extended portion was inaugurated during the Golden Jubilee Function of the University on 9th March 1972, by the then President of India Sri V.V. Giri. At the time of its establishment the library contained a little over 15,000 books inherited from the Canning College Library. Upto 31-1-1922, 3730 books were purchased and 272 journals were added. In 1922-23, a sum of Rs. 80,000 was allotted for purchase of books and Rs. 20,000 for equipments. From 1-4-22 to 15-1-23, 3246 books were purchased and 203 journals were subscribed. In 1926 total number of books reported on shelves were 31,356, number of borrowers was 940. Deiwey Decimal Classification Scheme was introduced. In 1927 several reference material viz. Encyclopedia Britannica 13th Ed., Historians History of the World, Sanskrit Worterbuch were added to its collection. In 1929 Bonarjee Library Section and Art Gallery was added to its folds. In 1931, books on shelves were reported as 43,572. Bound journals were 440. Periodicals subscribed 299. 46,394 books were issued to 1360 members giving an average of 276 books daily. In 1950, membership was 2236, number of books issued 73,595. Total number of books in the library was 1,41,185. There was 1386 Manuscripts. 17,728 books were issued from Bonarjee Library. Host of paintings, coins, art objects, oriental manuscripts etc. were added.